Wentworth Falls walking tracks would have to be one of my favorite bushwalks in the Blue Mountains region. And that is saying something as there are plenty of amazing walks and mountain bike trails in the blue mountains. 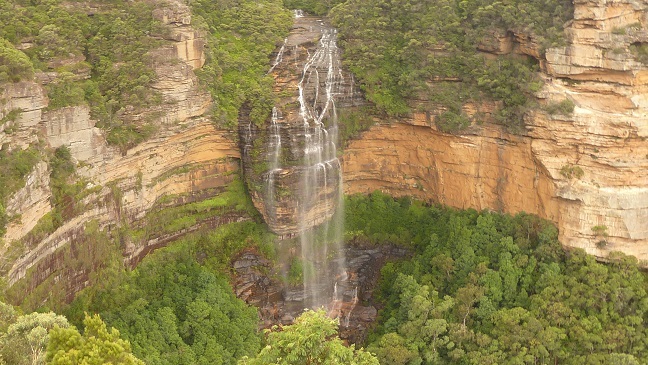 There are numerous walks to do at Wentworth Falls catering for easy to hard graded trails. There is a map at the Wentworth Falls picnic area which clearly marks out each walking trail which gives you a variety of options to view the waterfall. For those that only want to walk a short distance the Princes Rock lookout is the one for you. It’s just under a kilometer return walk going down a moderate slop. The photo at the top of the page is from the Princes Rock lookout. For the more adventurous there are a number of options. The longest option is just under a 10km loop. My recommendation is to start at the Wentworth Falls picnic area, follow the signs to the Wentworth Falls track. Follow this track until you get to the National Pass trail. It’s well worth going down the Slacks Stairs for a look at the bottom part of the waterfall. Note this is a hard trail so only attempt it if your in good nick. From there you have a few choices. Head back up to the National Pass track and loop around via the Overcliff track. Make sure you make it up to Ladore Falls and Empress Falls as this is one of the best parts of the trail. Or you could take the Wentworth Pass track and loop back via the Overcliff or National Pass tracks. The walk I did on the map below is going via the Hippocrene Falls track which follows Jamison creek. This track can be difficult to spot at times and should only be attempted when accompanied by an experience bushwalker. So there are plenty of options on this walk. Enjoy. Directions to Wentworth Falls Waterfall. Google Maps link. Off the Great Western Highway turn down Falls Rd. Just follow it to the end which will lead you to the carpark.